Since I live in a small studio apartment I have a limited share of space for my crafting. Until a few weeks ago I kept all my stuff in two cupboards and a lot of stuff in boxes on my desk. It was a mess more or less, and each time I wanted to craft I had to take it out, make a mess and clean it up wether I was done or not since my computer and crafting shared the same table. I also replaced my large corner table with a smaller one (height adjustable tho so it was totally worth it). 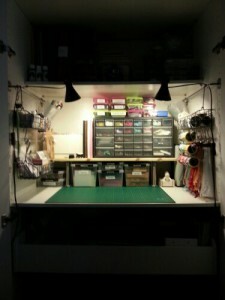 With the smaller table I felt a need for a closet or something to keep my crafting and the work in progress. I’ve been reading IKEA hackers for a while and I have seen a few crafting solutions over the years, a craftpod made out of Billy bookshelves made a strong impression on me and I have been thinking about it every now and then ever since. I realized that there is no chance for me to find room for one in my apartment but I kept pondering and arranging my furniture in different ways in my head. I just wasn’t able to let go, it became some sort of dream to have one of my own (this makes me sound like a crazy craft lady, doesn’t it?). This summer I decided to build a loft bed I have had in mind for a very long time and with that done I decided to make room for a closet too. You can read the first part of the story here. At some point I will show you some more images, there are a bunch in the first part of the story and it looks pretty much the same at the moment. So jump to my story (or simply enjoy the very bad image on this side) and I’ll keep you updated when something’s changed!